Sakutaro Hagiwara (1886~1942, a poet) compared his heart to hydrangea; the colour is easily changing and never satisfied with its present colour. I am sorry I can't translate his beautiful lines into English. Hydrangea is blooming in a rainy season, from mid June to July, in Japan. For us, the flower balls seems to be always bending their heads in wet. Lots of temples in Kamakura (near Tokyo but very old and beautiful historical town) are very famous with their beautiful hydramgea gardens. Two of my three hydrangea hearts are for swapping with Wilma in Holland and Jo in New Zealand. 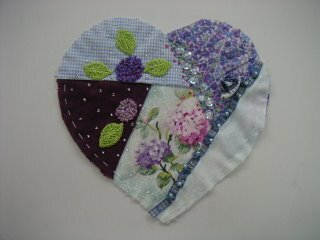 The last one is for my dear friend Ayako, who has visited this blog and commented often. She must have missed hydrangeas in Kamakura this year because of her illness. I hope she will be well soon. 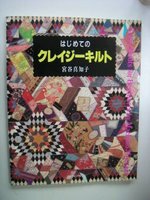 Machiko Miyatani is a wellknown crazy quilter in Japan. She lives in west part of Japan and has her class there and Tokyo. I live in north, so I only see her in TV or magazines. 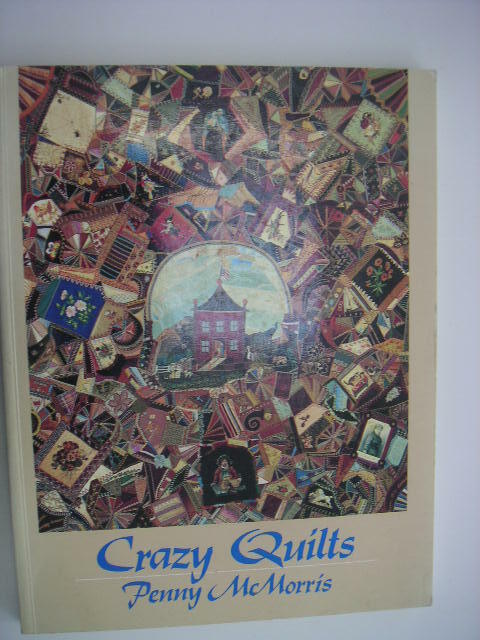 In 1994 she published "Crazy Quilts for Beginners", which is the first and the last Japanese book about crazyquilting. It has been out of print for years and is very hard to get now. 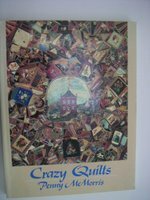 In this book, she says she learned her style from Peggy Mcmorris's "Carzy Quilts", in which we would learn the history of CQ and see lots of beautiful antique crazy quilts. 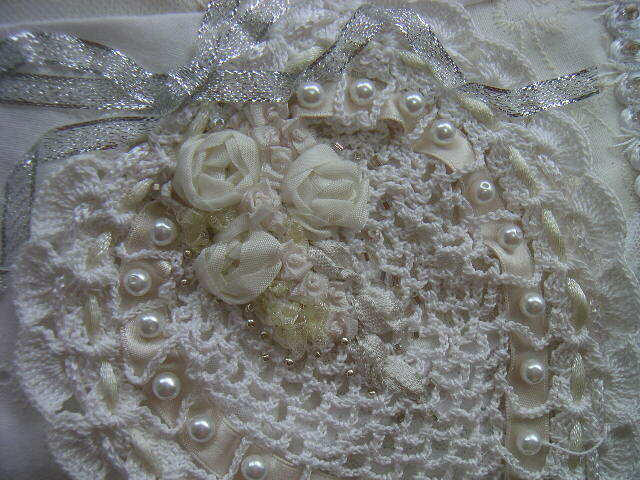 Machiko's works are really beautiful, elegant and classic. 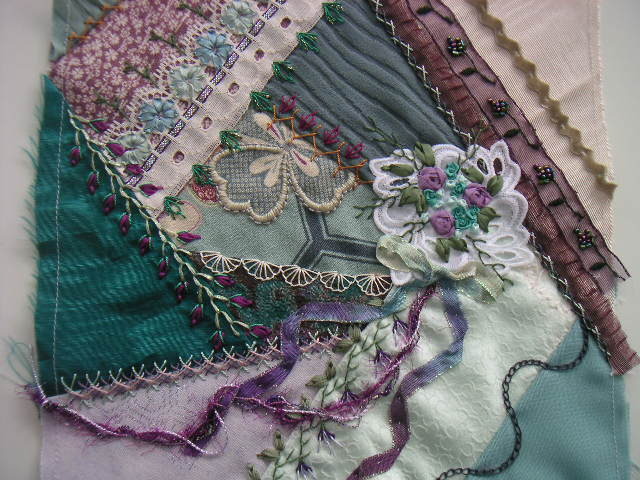 Fabrics are gorgeous and seam stitches are neat. I love to see the photos of her beautiful and Japanese flavor added works in this books. 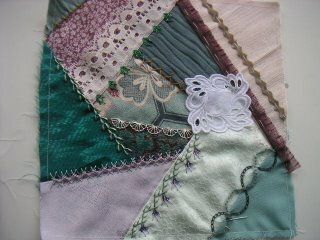 When piecing blocks, she uses designed patterns. I don't know the reason. But is it easier for beginners, I wonder. In my class I have never recommend patterns. 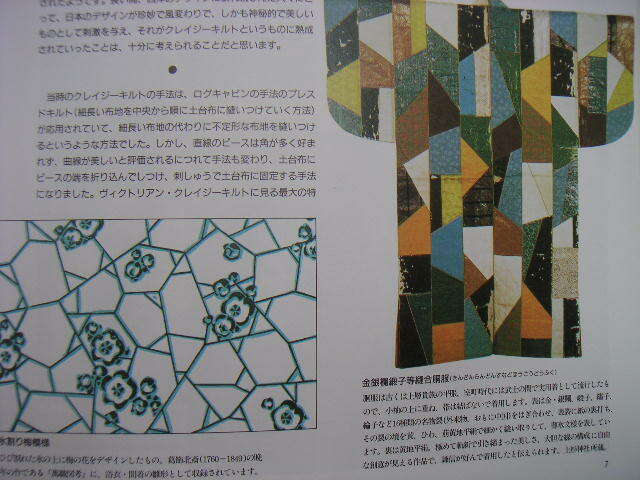 Last time I mentioned about some Japanese traditional patterns which influenced CQ. 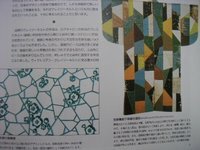 You may see two photos in her book; one is the pattern by Hokusai(a famous wooden printer) from Edo era (mid 18c~19c) and another Kenshin's kimono from 16th century. 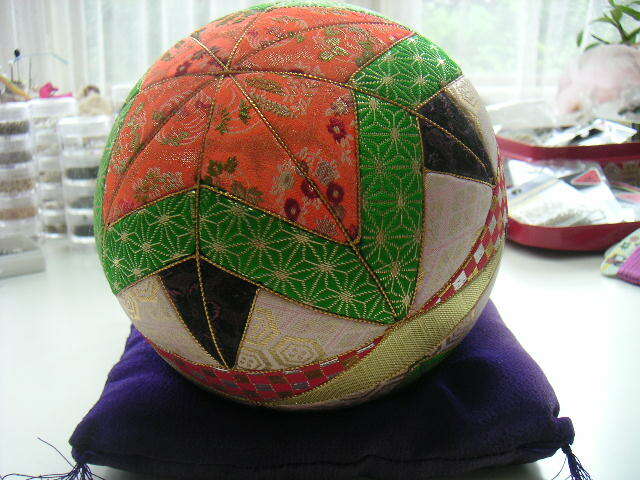 Temari means a "hand ball". It's not a toy but a traditional Japanese handcraft ornament embellished beautifully by threads. You would see there Japanese artistic sense. To make temari seems to be a popular craft, for we can buy those threads very easily, while to find DMC rayon is hard. Though those threads are polyester today, they have so silky touch and softness I like to use them for CQ. They give very nice accent. There are many colors and lames in variety. The thread is a bit fat and we can't separate into strands. 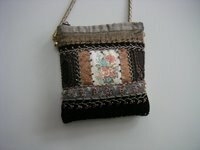 The temari of the photos is not embellished by threads but fabrics. 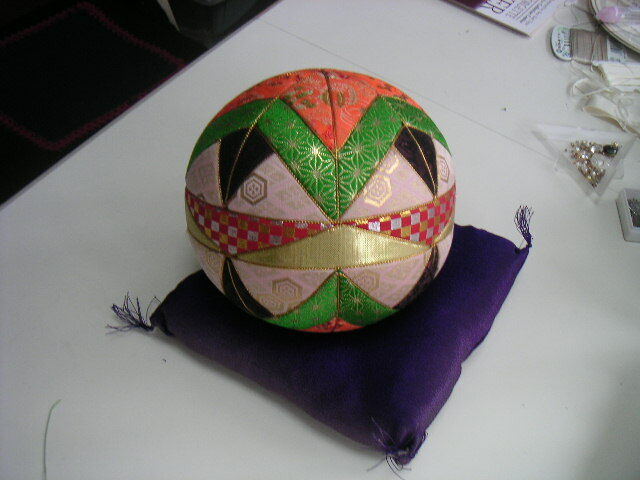 It's made in KIMEKOMI style, another Japanese craft. Foreign CQers might see a crazypatched style in Oriental way there. In Machiko Miyatani(a Japanese wellknown CQer)'s book,I have read that Western people were so impressed by Japanese traditional not-symmetry patterns, they took the style into Victorian crazyquilting. 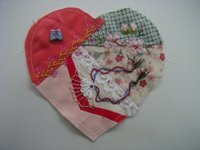 She also introduces in the same book, a beautiful crazypatched kimono a famous Japanese lord, Kenshin Uesugi wore in the end of 16th century. It's passed 33 days since Sharon's "100 details in 100 days" started in Mid June. 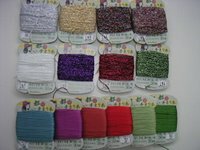 When I was a beginner, I tried lots of variation of seam stitches; single stitch, two combination, three combination, in one color, two colors, three colors and more, with beads or without beads, etc. 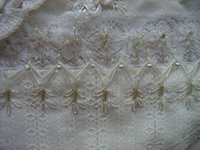 This time as a color combination I am using only white, ecrue, beige and cream. 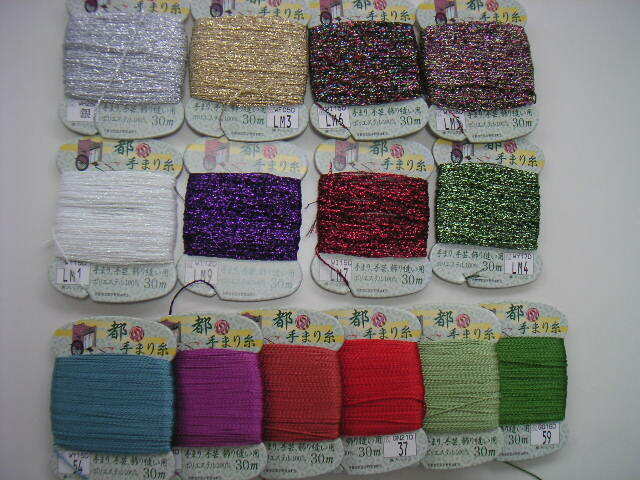 But threads are really in variety; DNC#25, DMC rayon, a few kind of Japanese silk threads, sewing machine threads, TEMARI threads, hemp threads, etc. I am enjoying their combination in variety. When I decided to learn more about CQ and joined the Crazyquilting International group, Debbie Reed was the first person who sent me a welcome greeting. It was from Okinawa. She lived there for three years as a missionary wife and was just going back home to US. 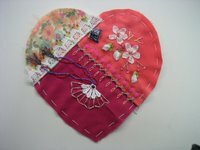 She has also encouraged me with this blog.I have put her blog in the link. 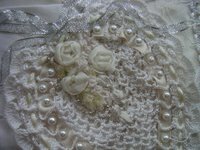 You can see her gorgeous work she did for her parents wedding 42th anniversary. 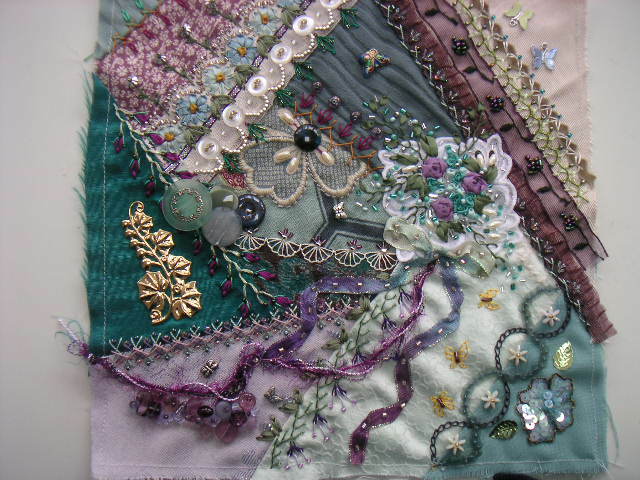 And if you open the crazyquilt mailing list, you would find her beautiful works more in her albumn. 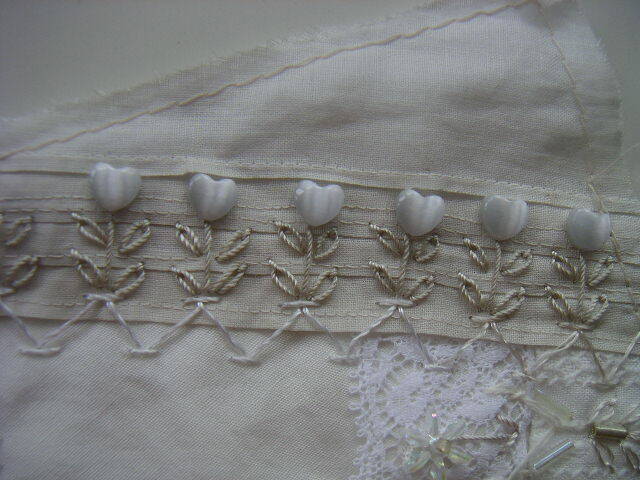 I love her "Cotton Bells" so much. As she was in Japan, she knows Japanese quilters' names and works. I love her "Cotton Belles". I know she admireｓ Michiko Sonobe very much. And I know another US CQer who loves Michiko's works, for I sent her a copy of the book. (I will intruduce her next time.) I am always seeing Japanese quilt magazines and books in the item list from the Vitage Vogue. Japanese quilters and their works seem to be drawing attentions from abroad. 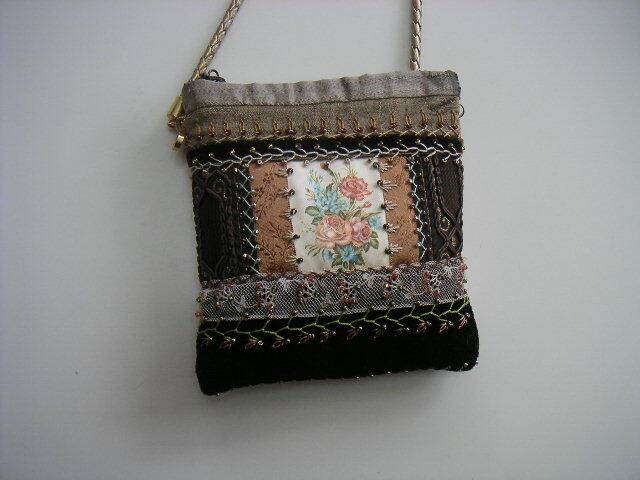 I have uploaded the photo of a small purse I made a few years ago, using a pattern from Michiko's book. In this February I took an online class of Sharon Boggon, a very well-known Austrailian crazy quilter, I had admired for years. 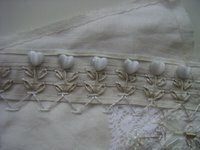 She taught us everything; colour coodinating, piecing, seam stitches, motifs embroidery, using of braids and laces, beading and button clusters and etc. She answered our questions and encouraged us much. In addition, she made a group after the class. We, students made comments and praised each other, and became friends. We were required to have our own albumn then and I made mine in Flickr site. 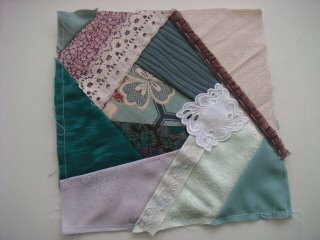 You would see how my naked block progressed to be completed. I was so satisfied with my completed one I gave it a title "Summer Breeze". 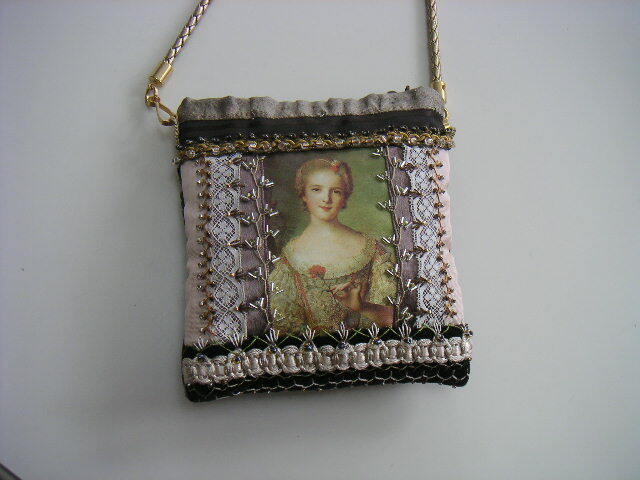 I received many nice comments from others with it. I will add the sites of HPs and blogs of oversea CQers one by one for Japanese readers and also would add Japanese links as well for foreigners who might be interested in our culture. I would like to ask Japanese readers to help me. I have finished two hearts for Candji in US and Ati in Norway. When I make something for swapping with oversea people, I usually try to give my works a Japanese air, though I don't think my sense is better than average here. But still I must have some native sense more than Westerners. Though I haven't been so carefull with our own culture before because they are too familier to be, I am watching them more consciously now, even a TV drama. I really enjoy seeing and learning kimono coordinates in it. 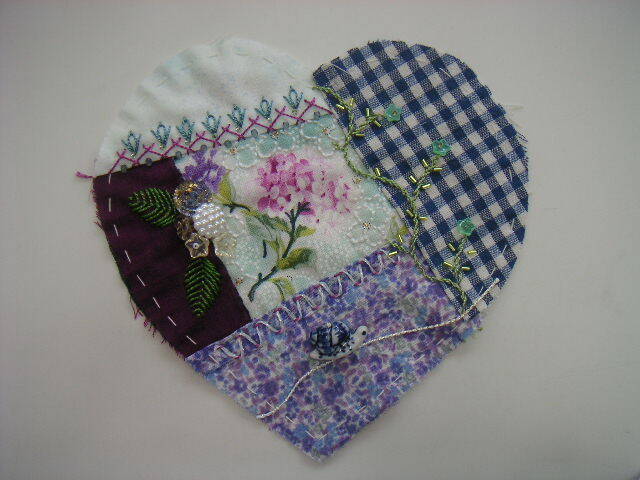 Anyway here are all of my hearts I have been making since this spring. I like to see them together. Today I mailed out my naked blocks for Christmas DYB of CQI. 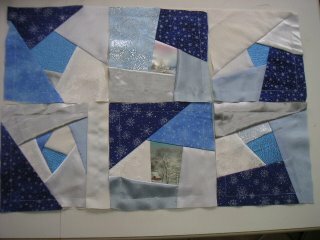 I chose the blue reminding us the wintery scene. 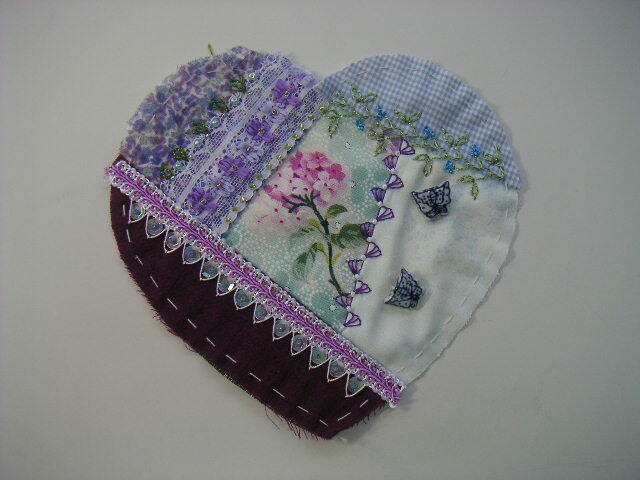 I have had my blog in Yahoo.jp since this March. But it's so inconvenient I've decided to move here. I will use both Japanese and English depending on the situation. If you are interested in my old blog, please access to the addy above. I hope my world extend broader here.